BARBERVILLE, Fla.: Daryn Pittman thought he was in trouble on the last lap of Saturday’s main event at Volusia Speedway Park. There was heavy traffic, and Pittman, admittedly, missed the bottom pretty bad in the first and second corner. A black car in his vision had position going into Turn 3, and Pittman expected him to take away his line. It didn’t happen. That’s because Christopher Bell, who was driving the dark Swindell SpeedLab machine, was over a second back. Then again, you can’t blame Pittman, because the two put on a show over the non-stop 30-lap race distance. But in the end, Pittman had the better car and took advantage of it. 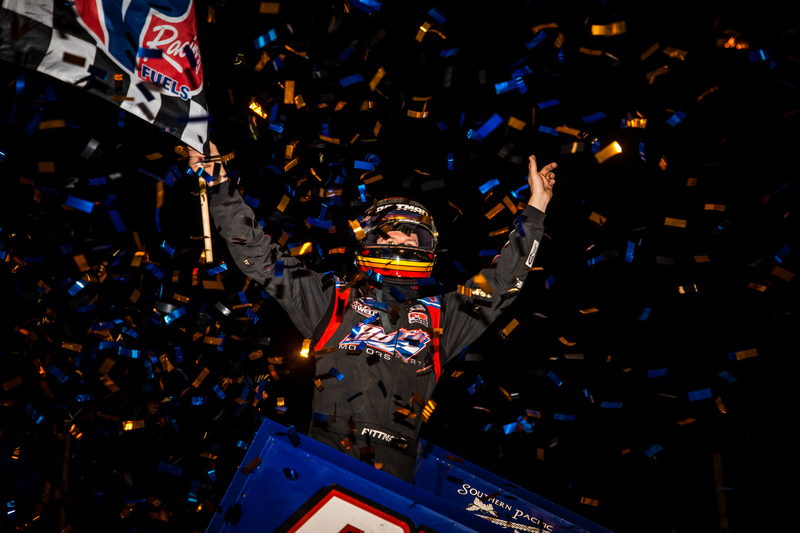 He won an entertaining battle with Bell to capture his second straight World of Outlaws NOS Energy Drink Sprint Car Series win to start the season during the DIRTCar Nationals. “As a driver, I felt once I got the lead, it should’ve been the end of it,” said Pittman after his 83rd career World of Outlaws win. “My car was better, and once I gave the lead back, I thought I was in trouble. Pittman admitted he made mistakes during the main event, but from the stands, it just looked like two guys racing hard for the win. Bell started on the pole and shot in front of Brian Brown and Pittman to lead Lap 1. Carson Macedo knocked Pittman down to fourth on the next circuit with a slide job through Turns 3 and 4. A light rain shower fell before and, at times, during the A-Main. But, it didn’t hamper the action on the track. The frontrunners caught the back of the field on Lap 8. Pittman took advantage and slipped past Macedo for third. Two laps later, he ripped around the top of Brown and took the runner-up spot. “I expected it to widen out,” Pittman said. “It’s been hard all week, and even though it’s wet, it’s going away quick when we put a lot of laps on it. I expected it to go away, so we pretty much did the same thing last night with our car. “Last night’s race was great for the fans, but from my standpoint, I just ran the bottom and didn’t do anything exciting. The fans got a treat. Pittman closed to within .407 seconds on Lap 13. Two laps later, he showed his nose to Bell in Turns 3 and 4 and was .224 seconds back at the stripe. Bell kept the hammer down on the top of the speedway. Pittman was glued to the bottom and middle of Turn 4, which paid off on Lap 19, as the Owasso, Okla., native pulled out front by a mere .024 seconds. The lead was short-lived. Bell blew around the top of Turns 1 and 2 on Lap 20 and sailed around Pittman to regain the lead. “I felt like the longer the race went on, I had a better car,” Pittman said. “I just made a lot of mistakes. I got the lead, missed the bottom, and he drove back by me. Bell stretched his lead to .718 seconds on Lap 20 and appeared to have the race in hand with 10 laps to go. But, Pittman didn’t give up. He kept coming on the bottom and showed his nose in Turn 4 on Lap 25. While Bell and Pittman battled, Donny Schatz was coming to the front. He disposed of Brad Sweet and Brown by Lap 25 and closed to within a second of the top two. It was the best seat in the house. Pittman slid Bell in Turn 4 on Lap 26. One lap later, Bell got a run and slid Pittman through Turns 3 and 4 to briefly regain the spot. That was the last highlight for Bell. Pittman nailed the top through the first and second corner on Lap 28 and pulled out front for good. “You always look back on races and think, ‘What could I do different, what should I have done different,’” Bell said. “At this point, I haven’t watched film and don’t know what I could do different, and I feel like I ran a perfect race. Pittman owned the last three laps of the race. Despite a last-lap bobble, he took the win over Bell by 1.119 seconds. The victory made it four straight podiums for Pittman in four events this season, two of which were wins worth $10,000 apiece. “I have to pinch myself, because there are 30 teams who worked just as hard over the winter time and had the same expectations,” Pittman said. “Every win is hard. Schatz was third, followed by Sweet an Brown. David Gravel charged from 15th to finish sixth. Feature Finish, 30 Laps: 1. Daryn Pittman; 2. Christopher Bell; 3. Donny Schatz; 4. Brad Sweet; 5. Brian Brown; 6. David Gravel; 7. Aaron Reutzel; 8. Logan Schuchart; 9. Jason Sides; 10. Carson Macedo; 11. Lucas Wolfe; 12. Tim Shaffer; 13. Sheldon Haudenschild; 14. Cory Eliason; 15. Kraig Kinser; 16. Parker Price-Miller; 17. Paul McMahan; 18. Spencer Bayston; 19. Shane Stewart; 20. Kasey Kahne; 21. Cale Conley; 22. Brent Marks; 23. Brock Zearfoss; 24. Shane Golobic; 25. Ian Madsen; 26. Jacob Allen. DNQ: Mason Daniel; Chad Kemenah; Brant O’Banion; Danny Dietrich; Tom Harrs. NOTE: Brent Marks and Jacob Allen took provisionals.